I ordered the mommy and me for my daughter and me as a present. It's$60. I was so disappointed in it. I won't be making this a regular subscription, nor will I gift it again. It's not worth it. I got two candles and one candle holder. Cheaply made bag and a cup. I paid for the 33 dollar one. I Cant believe all the go reviews it's gotten. I bought this as a gift and my friend absolutely loved it! 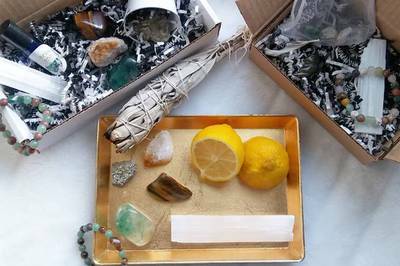 Each month you will receive an assortment of beautiful crystals, semiprecious stones, charms, or talisman. Each month has a theme. The employees work HARD and it’s obvious they love their jobs. It shines through in the work they do. I am really sorry to do this but I subscribe to both the VIP and the Woo box. This month, neither were worth their price. As a Florida resident, the woo box came with a skirt wrap, 2 standard sea shells, a mini-bottle of sea shells and a plastic flowered lei and hair clip that I can buy at the dollar store. It even had a tiny plastic surf board and drink umbrellas... yes, the keychain said it was made in Hawaii but it looks like any trinket that I could get in Key West. I appereciate the plant, and the salt candle holder but the whole box is not worth $33 a month. I looked forward to getting my box each month. Every month has awesome items and I learned something new with each one. Highly recommend! This is my favorite crystal box that I’ve received so far. The best quality crystals (and that’s the main reason I subscribe). The jewelry was not my taste and I could have done without the mini grid. A bigger grid on paper would have been better. But that’s just my opinion. You can’t love everything in every box. I unsubscribed, but only because I saw that they had a new website and I wanted to support them there. I can’t wait to get my next box. Also I’ve had many people ask me for a discount code or referral program. Y’all ready rock! I was so estatic with this month’s box and the stones are gorgeous. I’m so happy with everything. I cannot wait for next month! Thank you so much! After much debate, I decided to begin practicing again but more seriously so I ordered the Woo Woo box. I liked what was included in the box for June. Although, I had hoped for a crystal to begin my collection. Beautiful items but nothing stood out to me as unique or worthwhile. Lovely box, but not for me.